Cygwin is a collection of tools which provide a Linux look and feel for Windows. It includes the equivalent of many Linux binaries, such as cat, nano, less, etc. 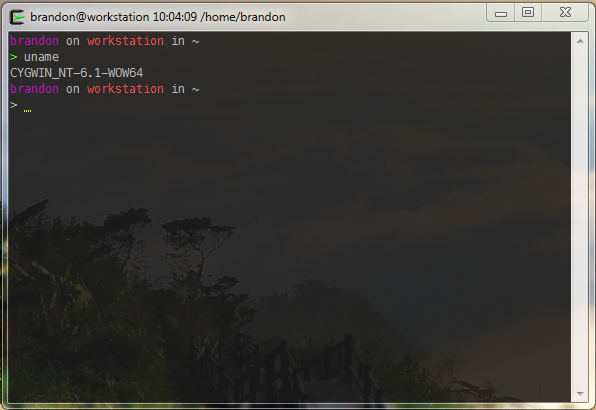 It also includes a nice command prompt, far nicer than the built in Windows command prompt. I use Cygwin almost exclusively on Windows, since the available Window command prompts are so awful. You can run available Linux programs as well as any Windows programs from the Cygwin shell. I use Cygwin for working with Git, Vagrant and SSH mostly. The first step is installing Cygwin. To do this, you must download the installer. I recommend the 64 bit installer, assuming you’re on a 64 bit OS. It doesn’t really matter where you install it, but I recommend the default path (or at least installing it to the root level of one of your hard drives). Cygwin has some annoying default behavior that I would strongly recommend changing. Go to Mouse in the left menu, and uncheck “Copy on select”. This behavior will cause cygwin to copy highlighted text to your clipboard. When trying to paste something in Cygwin, this gets annoying as it’s very easy to accidentally select something, thus clearing your clipboard. Recommended: Change the cursor color to yellow or something else very visible (Looks > Colours > Cursor). Recommended: Change the cursor to an underscore (Looks > Cursor > Underscore). Makes it easier to spot. If you don’t have a shortcut for Cygwin, you may be confused about how to start it. A cursory look around the installation directory won’t include any obvious cygwin.exe files or the like. That’s because Cygwin isn’t a terminal, its a Linux API layer. The terminal is MinTTY, which you can start manually from the bin directory of your cygwin installation. It’ll be called mintty.exe. Mine is located at D:\Cygwin\bin\mintty.exe. Once you’re setup with Cygwin, I recommend adding Tmux to the mix. It adds tabs & multi-pane support to MinTTY, and will significantly improve the way you work! Thanks for writing this up. I’ve been using cygwin on my w10 machine to ssh into my centos server, so I basically could be using puTTY instead. So I’m scouring the web for suggestions on how to get more out of it. I’m going to set up tmux next. One note: ncurses is now under the Base category.